We inspire talented and curious students by encouraging intellectual exploration, fearless analysis, and the pursuit of bold new questions. Through our uniquely UChicago curriculum and style of teaching, we engage young minds with formative ideas and approaches in an environment where they are challenged by leading scholars – and taught to challenge in return. Academic study at UChicago College is comprised of three components: the Core curriculum, a major program, and electives. Graduate study, interdisciplinary opportunities, and joint degree programs are also available. All students in UChicago College begin their undergraduate education by taking courses from the Core curriculum, an integrated, often interdisciplinary, sequence of courses that are designed to establish the habits of mind and the critical, analytic, and writing skills that are expected of an educated, well-informed member of modern society. The Core serves as an introduction to the tools of inquiry used in every discipline—science, mathematics, humanities, and social sciences. The goal is not just to transfer knowledge, but to raise fundamental questions and to become familiar with the powerful ideas that shape our society. Read more about the Core. 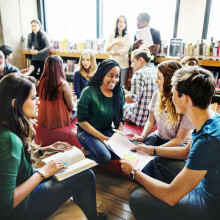 Just as the Core provides the broad foundation for addressing key intellectual questions, major programs of study provide students with a depth of knowledge and sophistication in a particular area of inquiry – whether a traditional academic discipline, an interdisciplinary program, or a program of a student’s own design. UChicago College's 52 majors reside within one of the five Collegiate Divisions, and range from nine to 19 courses, depending on the specific requirements of UChicago’s academic departments. Information about the majors and their requirements are described in the College Catalog. UChicago College’s 41 minors permit students to use their free electives with intellectual effectiveness and precision—to take a cohesive set of courses that complement studies in one’s major or to explore an unrelated area of intellectual interest. Minors typically require five to seven courses and are counted towards one’s electives. Each program outlines its particular requirements for a minor in the College Catalog. Pursuing a minor (or minors). Taking on an independent research project. Acquiring advanced training in a second language. Highly motivated undergraduate students often turn to graduate study to take full advantage of their time on campus. Students in UChicago College may enroll in graduate and professional school courses while completing their undergraduate studies. Available courses can be found in the graduate division, Chicago Booth School of Business, the Law School, Pritzker School of Medicine, Harris School of Public Policy, and the School of Social Administration. Students are encouraged to speak with their advisers about taking advantage of these opportunities as soon as their second year in the University. Learn more about graduate and professional school courses. A number of departments in the University offer joint BA/MA programs or a professional option for students who have completed a significant portion of their undergraduate program early and want to concentrate their electives in order to begin their graduate-level studies early. Joint degrees span departments from across the disciplines and offer both 4-year and 5-year programs. Learn more about joint degree programs. Through a number of programs and initiatives, the University brings together scholars from a variety of fields to engage in sustained interdisciplinary collaboration. Courses offered through Big Problems, Chicago Studies, Clinical and Translational Science, and the Stevanovich Institute on the Formation of Knowledge offer students the opportunity to engage in training, undertake projects and ask questions that span multiple fields of study. In Europe, Asia, Africa, Latin America, and the Middle East, UChicago undergraduate students live the life of the mind, one great city at a time. The College Center for Research and Fellowships (CCRF) supports students as they pursue transformative experiences through scholarly undergraduate research and nationally competitive fellowships. The CCRF promotes meaningful connections between faculty and students, encourages mentorship, provides high-impact advising and events, and educates the broader UChicago community about these opportunities for all UChicago College students and alumni. Throughout every step of the academic journey, UChicago provides programs and support to ensure students achieve their full potential. Extended learning to further intellectual development within specific fields of interest.